The Federal Highway Administration (FHWA's) Climate Change & Extreme Weather Vulnerability Assessment Framework is a guide and collection of resources for use in analyzing the impacts of climate change and extreme weather on transportation infrastructure. Its purpose is to identify key considerations, questions, and resources that can be used to design and implement a climate change vulnerability assessment. The processes, lessons learned, and resources outlined in the framework are geared toward state departments of transportation (DOTs), metropolitan planning organizations (MPOs), and other agencies involved in planning, building, or maintaining the transportation system. It includes suggestions and examples applicable to a wide range of applications, from small qualitative studies to large, detailed, data-intensive analyses. The resources included in the framework will be added to and updated over time. 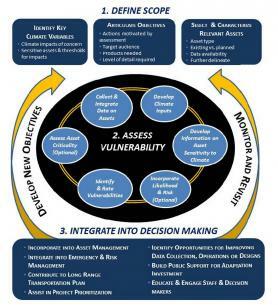 The framework guides development of a vulnerability assessment from defining the scope of the project to integrating information into decision making.